Paul Revere may have said ” The British Are Coming “, however Drum Corps Associates can say that the Kidsgrove Scouts from Staffordshire, United Kingdom, are returning this season for the fourth time ! Established in 1910, the Scouts will be arriving here on August 21st and this season they will be competing on August 26th in the Reading Buccaneers show on that date. They will have over one hundred plus corps members, thirty staff members, and seventy supporters in their group. Even though this is their fourth trip, they have all presented different problems and great opportunities. This year the financial concern is huge, but the corps will be able to overcome it. Darren Truby, the corps tour/corps manager and Deb Heesom the tour treasurer help out in the plane and organization aspects for the tour along with a supporting staff. Funds for the tour are raised in the same manner as the last three. Members pay their own tour fees. The corps fund raises and everyone does their part to make this an exciting and memorable trip. System Blue will be helping with equipment that the corps will need and some items need to be finalized. System Blue has ben a part of the Kidsgrove family since 2016 and have helped greatly in many different areas. Their 2017 program is titled ” Montagues and Capulets ” as the corps members have been busy the last couple of camps learning the content to the show and it is taking shape very nicely. The design team have worked closely together over the last couple of months to produce one of their finest shows to date. They also have been lucky to have involvement from consultants such as John Meehan from the Blue Devils to assist the program. 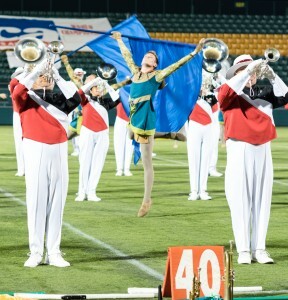 The lovely Kerrie Brett returns as Drum Major for the corps and looks to retain her title as Best Drum Major award she received at the 2015 DCA Championships. 2016 was a highly successful season for the Kidsgrove Scouts. They placed third at the European Championships taking high field music and second place at the DCUK Championships. There are five units that comprise Kidsgrove. The Senior Corps, a Junior Corps, an Open Class Winter Guard, a Class A Winter Guard and a Cadet Winter Guard. The Open Class Winter Guard has been highly successful at the DCUK Championships taking first in 2014, second in 2015, and first again in 2016 ! In 1962 Group President John Swindells marched with the Madison Scouts at the Wisconsin State Fair to touch on some corps trivia. The goal for the 2017 season for the Kidsgrove Scouts is simple. Entertain the crowd, enjoy themselves performing to the fans, and getting everyone on their feet at the end of the performance. PR Manager, Sam Catcliffe summed it all up perfectly in his message to the fans of DCA. ” To reflect on everything since the organizations establishment in 1910, this is our 107th year and our success, not based on titles, but accomplishments on providing people with great performance opportunities and memories means a lot to us. Every year has been just as important to building who we are today and its great to see new and returning members come to share more memories. DCA holds a special place in all our hearts as we all say it is living the dream. The fans of DCA just make it extra special as your unbelievable welcoming to us is exactly the reason we come back! “. That drum corps fans is what it’s all about! Special thanks to Corps Director Rob Swindells and PR Manager Sam Catcliffe for providing the information for this article. 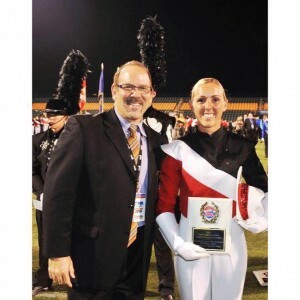 The Kidsgrove Scouts will provide more information on their visit to the United States at the beginning of August.